Zelda and Studio Ghibli seem to naturally go together. It's why you get so many crossovers on the subject, including this fantastic Totoro and Link mashup from artist Wahoo. 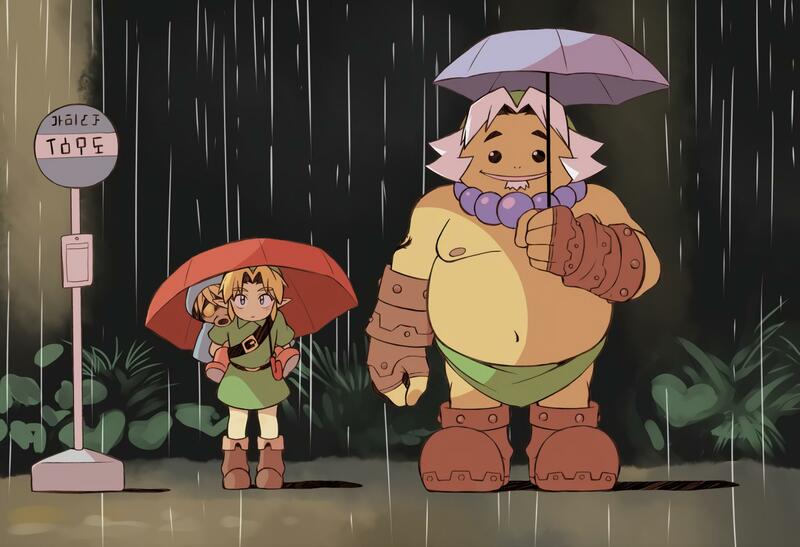 The iconic "waiting in the rain" scene is probably the production company's most well-known piece of art at this point; but this time Link and Young Link sub in for siblings and My Neighbor Totoro protagonists Satsuki and Mei, with a Goron playing the role of the titular character. As fans have pointed out, the sign is actually different from the film's version and reads "Destination: Great Bay," a nice touch. This isn't the first time Wahoo has tackled Zelda, so if you dig the above scene I'd highly recommend checking out their work.